13 entrants competed for the £1000 award, including competitors from the Royal Welsh College of Music & Drama, the Royal Academy of Music, the University of Chichester, Performers College, Guildhall School of Music &Drama, Arts Educational School, E.15 Acting School and one private student of an AESS member. There was a great variety of material, showing the care the competitors had taken in compiling their 6 minute presentations. They all supported each other by sitting in the audience throughout the prize, only leaving to prepare for their own “slot”. The adjudicator, Marilyn Cutts, gave a very comprehensive talk at the end, covering the points that she felt they could build on. Both non-competitors and competitors were given an interesting insight into the requirements of a performer. Sarah Leonard, Chairman Elect of the AESS, thanked Marilyn and the competitors for a very enjoyable afternoon. Chris Mear, the official accompanist, and those brought in by the competitors also were thanked for their work. The prize was awarded to Lizzy Andretta, from the East 15 Acting School, who performed “Val’s Monologue” & “Dance:Ten; Looks:Three” from A Chorus Line. Thanks to all the AESS members and friends who were able to come and support this prize in its second year. We are grateful to Jean Hornbuckle and Jane Roberson, the Co-ordinators. Thanks to the Sylvia Young Theatre School for hosting the competition and to the Tony Fell Trust for its generosity in sponsoring the competition. Marilyn Cutts presenting Lizzy Andretta with her prize. This entry was posted in Past Events on June 8, 2014 by AESS. On a very sunny Sunday afternoon by the sea, a receptive audience was treated to a wonderfully devised tribute to Michael Head for which all the credit goes to Patricia Williams. The carefully selected programme of song and poetry was linked with history and reminiscence by Liza Hobbs and Graham Cooper. 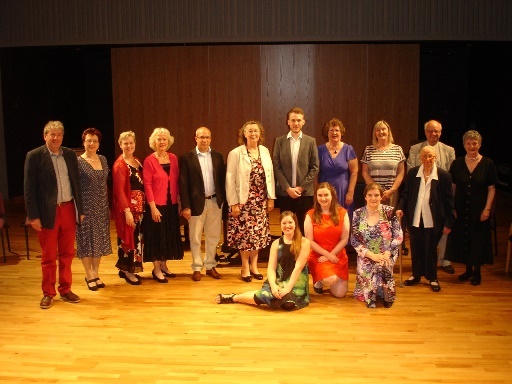 Poems were read by Una Warnes and songs sung by Margaret Cadney, Lesley Cooper Lyn Cook, Julia Dewhurst, Sarah Leonard, Katarina Melling, Melanie Mehta, David Phillips, Graham Trew, Alexandria Wharram and Patricia Williams. The pianists were Diana Bickley, David Williams and Patricia Williams. The programme finished, most appropriately, with a recording of Michael Head singing and playing ‘Had I a Golden Pound’. Thanks are due to Carolyn Richards and Joyce Lorenstein who masterminded the refreshments and to the staff of the Birley Centre for their assistance. Left to right: Back row: Graham Trew, Sarah Leonard, Melanie Mehta, Julia Dewhurst, David Williams, David Phillips, Margaret Cadney, Lyn Cook, Graham Cooper and Liza Hobbs. Front row: Alexandria Wharram, Katarina Melling. Patricia Williams and Una Warnes. This entry was posted in Past Events on June 1, 2014 by AESS.